Situated in Uelzen, this hotel is within a 15-minute walk of St. Mary's Church, BADUE - Badeland Uelzen, and Hundertwasser-Bahnhof. Holdenstedt Castle Museum and Sundial of Bad Bevensen are also within 12 mi (20 km). Uelzen Station is 11 minutes by foot. 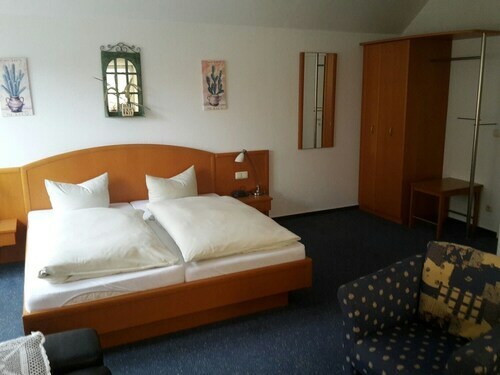 Situated in Kuhfelde, this hotel is 4.9 mi (8 km) from Jenny-Marx-Haus and within 20 mi (32 km) of Spätromanische Feldsteinkirche Kläden and Wiepke Church. Kalbe Castle Ruins and Abbey Church of St. Mary are also within 20 mi (32 km). Situated in a rural location, this spa hotel is within a 10-minute walk of Jod Sole Spa, Sundial of Bad Bevensen, and Tree Trek. Kurpark Spa Gardens and Museum Schliekau are also within 1 mi (2 km). Bad Bevensen Station is 19 minutes by foot. Situated in Wendland, this hotel is within 12 mi (20 km) of Archaeological Center Hitzacker, Old Customs House, and Hitzacker Castle. Dahlenburg Marktzplatz and St. Johannes Church are also within 25 mi (40 km). There aren't many hotels in central Kuesten. That said, Wotif offers 2 alternative options, all within 30 kilometres. Some recommended ones are the Parkhotel Hitzacker and Hotel Union Salzwedel. If you want to explore some nearby cities, check out Jastorf and Bad Bevensen. Travel 30 kilometres to the west from Kuesten and you'll locate Jastorf. Alternatively, Bad Bevensen is 30 kilometres to the west. Accommodations in Jastorf are the VitalHotel Ascona and Boutique-Hotel Das Haus am Walde. The Golf- & Wellnesshotel Zur Amtsheide and Sonnenhügel Hotel & Ferienwohnungen are some of the better ones in Bad Bevensen. If you are really into sports and want to watch games, you might like to make a trip to Volkswagen Arena, which is located to the south of Kuesten. The Ritz-Carlton, Wolfsburg and the TRYP Wolfsburg Hotel are near all the action. Located 100 kilometres from Kuesten is Hamburg Airport. Stay nearby at the Radisson Blu Hotel, Hamburg Airport or the Courtyard by Marriott Hamburg Airport. How Much is a Hotel Room in Kuesten? Hotels in Kuesten start at AU$118 per night. Prices and availability subject to change. Additional terms may apply.